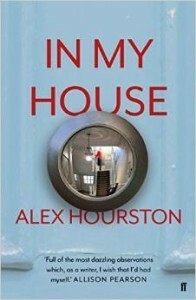 This week The Book Diner goes back to when I had a visit from the very lovely Alex Hourston shortly after her debut novel, In My House, was published by Faber and Faber). It’s a very exciting time for a novelist when a first book comes out as I know from my own experience with Welcome to Sharonville, so it was wonderful to interview Alex on the verge of her ‘coming out’ to literary society. Alex started writing at 37 following a M.A. in English and hasn’t looked back since. Her novel revolves around the unlikely friendship between a victim of human trafficking and the woman who saves her. We are both also members of The Beach Hut Writers, based in Brighton, and I think you will love her modesty and very insightful take on the writing life. Welcome to the Book Diner! Can we take your order – coffee, tea or soda? Eggs sunny side up or over easy? Home fries, French toast or biscuit? Pancakes with maple syrup please and a cup of tea. It was always in my heart, but I ignored it for years. I started writing at thirty-seven, after I’d gone back to university to do an M.A. in English. I treated it like a dirty secret for ages, then a hobby. My novel is out in May and I still struggle to look someone in the eye and call myself a writer. I don’t know if it will ever change. It’s something I hardly dared wish for. In My House tells the story of Maggie, 57; prickly, self-sufficient and wry, and living an ordered life in Queen’s Park with her dog. Then a young girl approaches her in the loos of Gatwick airport and whispers one word: Help. Maggie responds, saving Anja from her trafficker and the two begin a strange and intense friendship. The novel moves between the present and the pair’s evolving relationship and Maggie’s earlier life: her childhood in Brighton, marriage and motherhood in 80’s suburbia and, finally, the thorny and entangled set of circumstances that lead her to turn her back on it all. Maggie is intensely private. She hides a lot, from herself and others, for reasons that become clear later in the book. She has quite an anarchic inner life (don’t we all!) and I enjoyed playing with that. One of the great things about the novel versus other forms is that you can show what people are thinking. But the tough shell is there to protect her and as we spend more time with Maggie and the story evolves, she begins to become softer and give more away. I tend to meet a character just as you meet a real person, with a whole bunch of quite powerful first impressions, but little back story. I find out more through the process of writing. I tend to meet a character just as you meet a real person, with a whole bunch of quite powerful first impressions, but little back story. I find out more through the process of writing. I’m interested in how our pasts impact upon our present lives and the extent to which we can change that. Also, how easy it is for a decent person to do the wrong thing in a difficult situation. I’m not really into goodies and baddies; we’re all shaded, in my view. But I don’t think too much about themes when I’m writing. I let the characters and their story dictate where I’m going and refocus on themes in a later draft, though I try and keep it subtle. And certainly no message. I’m never certain enough about anything in life for that. A pantster, though every now and then a bossy little control freak pipes up in my head and insists that I start writing chapter plans and structure outlines. I do it, which makes him go away, but it doesn’t seem to help with the novel. Computer. It only feels proper once it’s saved as a document, though I have lots of scrappy notebooks full of scribblings. The style question is an interesting one; it seems possible. Tentatively. I want to get it accurate, but tend to focus on the inner lives of characters which is eternal, I think. My work is not autobiographical, but of course there are details and observations from life all through it. Yes and yes, to the next two questions, but I’m trying to grow a thicker skin. I start every day by going back over what I wrote during the previous one, but I don’t linger too long. I like to write a minimum of 500 new words each day. Then just keep going until I have a first draft. A huge sense of relief, at this point, and then I start again with the biggest structural changes first. By the time I’m doing line by line, I need the manuscript prised out of my hands. I get obsessed and I’m not sure I’m really improving things by that point. Keep going. Write your way out of the problem. You are only going to get better. Give yourself time. Toughest: It all takes so long! Best: getting to escape yourself for hours on end. Remind myself that it happens to everyone, even the best. Try to find the learning, where there is some, and forget it, where there isn’t. Jill Dawson, through her brilliant mentoring scheme Gold Dust and Antony Topping, my agent, who agreed to represent the novel half-done and despite the fact I had no idea what came next. He took a punt on me and put in a lot of time and work to get the manuscript ready for submission. Nowhere! I need no distractions. Silence. An empty house, ideally. So maybe the Arctic? Dogs. I’ve got two cocker spaniels. One is grumpy, introvert and only likes people she’s known forever. The other is hectic, bouncy and always breaking things. Make of that what you will. I am so talentless in every other creative area I can’t even imagine. I am half-way through my second novel. Doing various events, readings and interviews to coincide with launch (all listed on Goodreads). Enjoying that side of things, though switching from writing to publicity feels a bit like being dragged blinking from a cave. Switching from writing to publicity feels a bit like being dragged blinking from a cave. The usual online places: Amazon author page, Goodreads, twitter (@alex_hourston). Americano with hot milk, please.